Made from highly durable PET plastic which is recycled from water bottles and other similar plastic drinks bottles, this environmentally friendly full colour custom lanyard is mold and mildew resistant. Being 100% recycled, they make a great choice for any organisation trying to minimise their environmental impact or to showcase your green credentials. Our full colour process allows for photographic quality designs including gradients and shading to be printed on your lanyards. PANTONE® match your lanyards to your corporate or organisation colours. 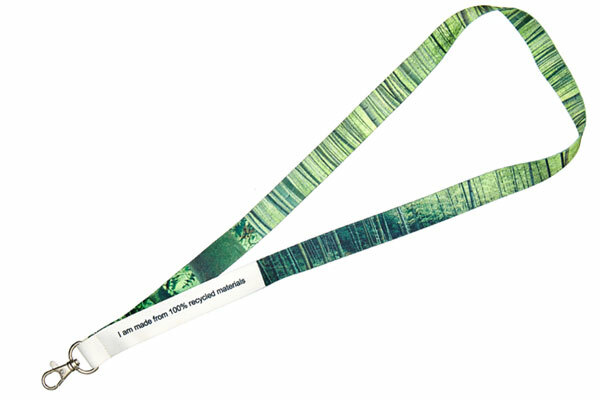 Our heat transfer lanyard printing process allows for a full colour design.